Humans perceive continuous reality in a form of discrete informational model. The discrete nature of perception was precisely pointed out by Zeno in his renowned paradoxes. The word is a discrete unit of thought. Any information can be presented in binary code. Black and White Model is based on a principle of duality represented by pairs of opposites such as black - white, light - dark, good - evil, Yin - Yang, left - right. Setting the boundary between the two is a matter of choice, that depends on one's abilities to discern. The direction you are looking in is what makes you define left and right, which may change as you turn your head. Very similar mechanism can be found in ethical judgement and formation of moral concepts. Any closed system, that remains unaffected by the the outside force will continue to develop according to the simples algorithm. Interaction between the discrete units will account for the increasing degrees of complexity. As the structure grows more complex the observer starts to get the sense of presence of Divine of some sort or a universal harmony principle. In reality the system is following the simplest path, as described by the medieval philosopher William of Ockham principle of parsimony in explanation, also dubbed "Occam's razor": "Entia non sunt multiplicanda sine necessitate" (One should not multiply entities beyond necessity). 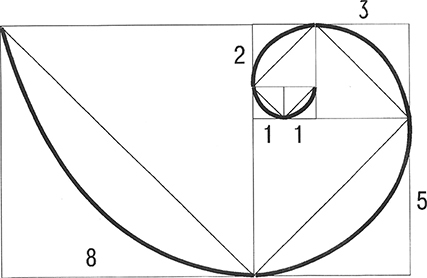 Fibonacci series: 1, 1, 2, 3, 5, 8, 13, 21... is the simplest thus the most universal law of discrete system development. At first the existing unit repeats itself, adds up to zero, reflects itself (which also is the primary function of human consciousness). The rest of the steps are identical: the two consecutive members of the series add up. The emerging sequence is approaching the harmonic ratios ("golden section") for the adjacent members of the series, graphically reflecting spiral movement. Pic. 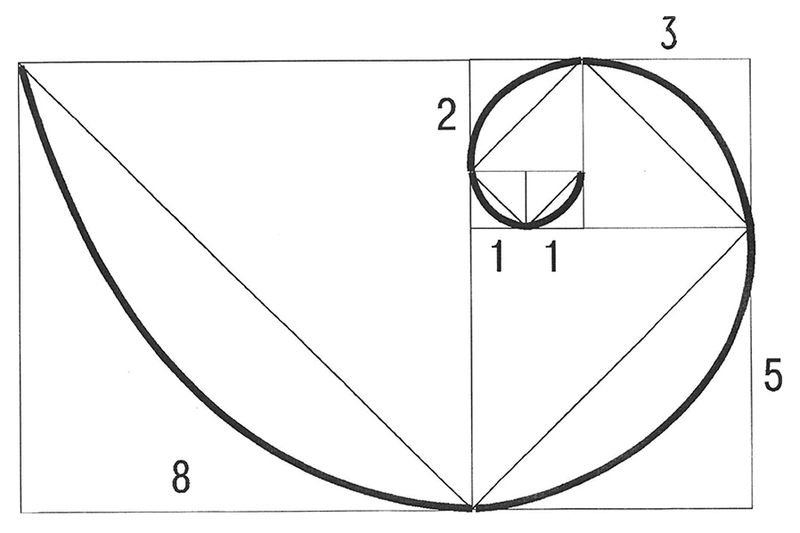 1.1 Spiral derived from "golden ratio"
That's how both galaxies and snail helix grow. 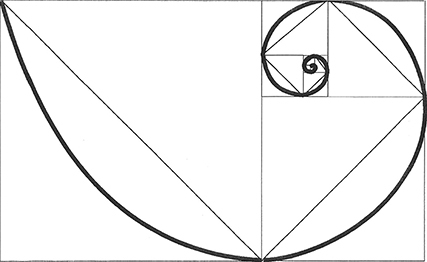 Logarithmic spiral is innately connected with natural logarithm function in mathematics. Function E raised to the powers of X - the reverse function of the logarithm remains unchanged during differentiation and integration. Assuming that system has been developing according to the rational principle of Fibonacci's sequence on some kind of an ideal, mathematic plane it remains unchanged. What is left to establish is how the initial, the first discrete unit comes to existence. 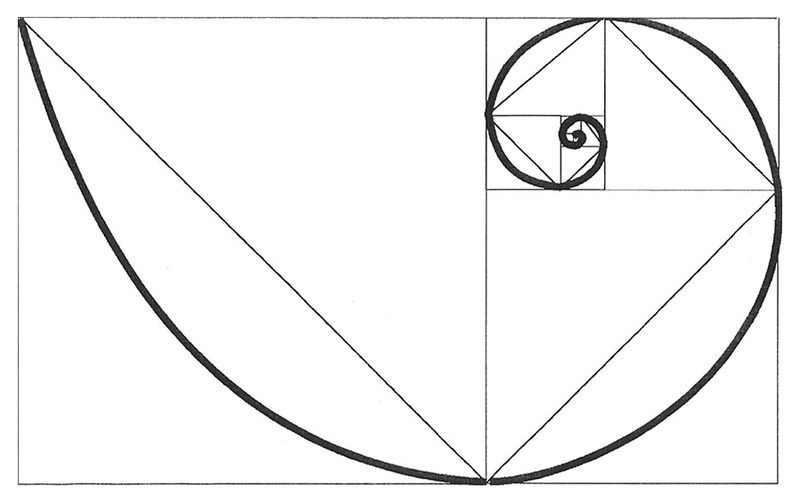 What Creation implies is how something emerges from nothing and where does the first member of Fibonacci's series come from? All of the concepts of Creation that we shall entitle "external" suggest there was the separation of darkness from light, performed by the Creator. Before the act of creation the light and darkness were not separated and existed in undifferentiated form. But there's no need in putting major effort to separate light and darkness. It's sufficient to simply discern the slightest shade of initial grey for Creation to occur! Let's imagine the neutral grey as the initial undifferentiated state. Then the emergence of the faintest gradient equals to a bit of information coming into being. The darker color will be considered "conditionally black" while the lighter tint will become "conditionally white". That's the way the "inner" creation based on ability to discern works. The opposite quality emerges when two states can be defined and differentiated. A bit of information in this case is simply a sensitivity threshold of receiving subject. By increasing sensitivity thus broadening the range of perception, a man manifests the universe and takes part in the creation. Let's start with the model outlined in the previous chapter, implying that the universe manifests itself with pairs of opposites, Yin and Yang for instance. Yang symbolizes active male principle and is depicted as solid line (empty circle, white color); also represents odd. Ying symbolizes passive female principle and is depicted as broken line (full circle, black color) also represents even. The further development of a discrete system may take a path different from Fibonacci series (reflection and summing up a pair of adjacent elements). In this case the system unfolds in space, not on a plane. Three-dimensional space, available for human perception is a corollary of encoding we are about to present. The next step for unfolding such system is not adding up another element, but grouping the existing two ("0" and "1") in triplets. Occam's razor remains in effect as the simplest natural algorithm is being realized. As a result of placement with repetitions we get eight trigrams, each containing a combination of Yin and Yang elements. Eight trigrams of the Book of Changes, written out as ones and zeros comply with binary-octal system, underlying all the languages of programming. A combination of 8 trigrams in pairs results in 64 hexagrams (placement with repetition of n elements times m). There are 64 codons in DNA (placement of four bases in triplets). The representation of color-coded coiled DNA spiral is shown below. 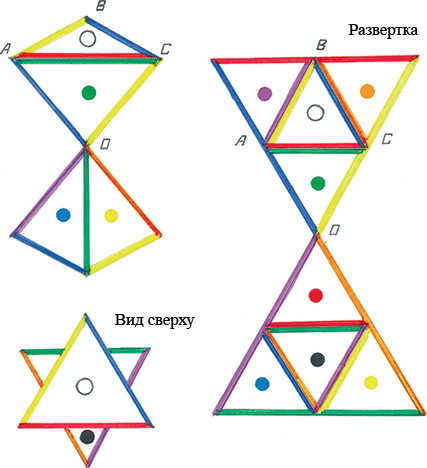 The Color Model proposed by the author allows to progress from trigrams to dimensional arrangements, that can be considered as universal development algorithms. Yang elements conform with primary, odd colors. Yin elements conform with complementary colors, containing of a pair of primary colors mixed together, we will call them even colors. When all colors of spectrum are combined together the achromatic grey is produced. Mixing three primary or three complementary colors yields the neutral grey as well. Take a note of the relation between the basic and complementary colors as represented in a human perception phenomenon known as the "negative afterimage". In the aforementioned theory of "Inner creation" a bit of information comes to exist when human ability to discern the gradient evolves sufficiently; in the same fashion the nature of mutually complementary colors is physiologically determined. Human perception unfolds the universe being the agent of Creation itself. 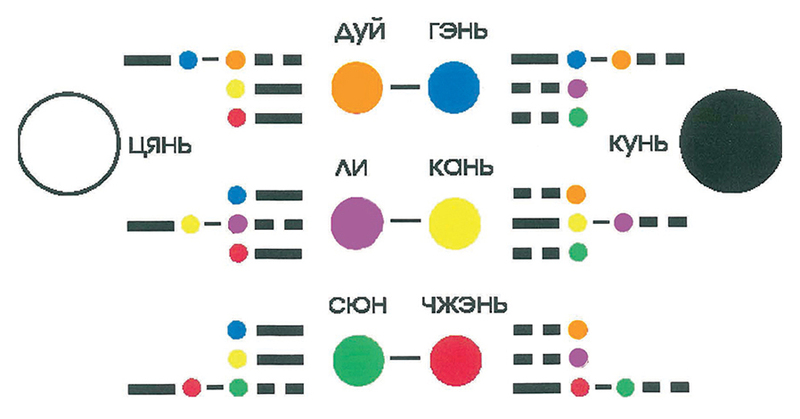 Perception of space inherent to us, can possibly be the color representation of binary-octal code. The color interpretation appears to be a system where two opposite principles Yang and Yin (black and white) transmutate via color transformation. The system is closed and self-sufficient, it cannot be altered without impairing its completeness. 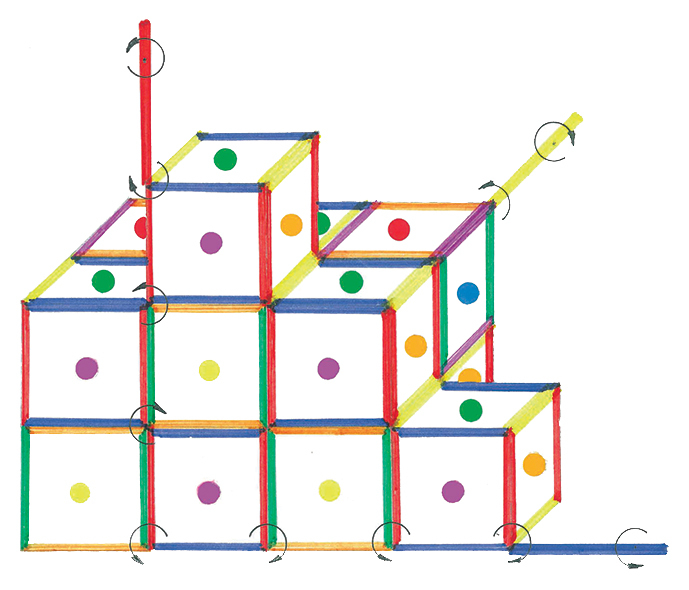 The color interpretation of I-Ching trigrams allows building three-dimensional constructions, impossible if the original trigrams are used, since manipulations with trigrams in space makes the sequence of lines uncertain. 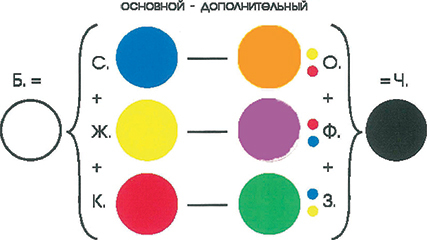 Color remains unchanged regardless of orientation in space. 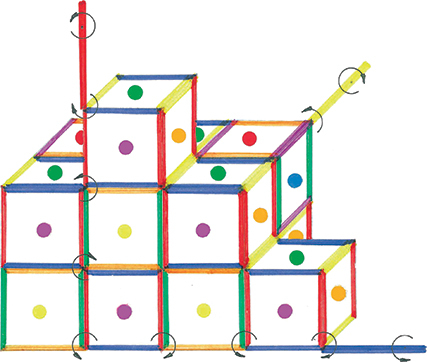 The following three-dimensional constructions are presented without detailed explanation. This shape fully conforms with color interpretation of I-Ching trigrams. 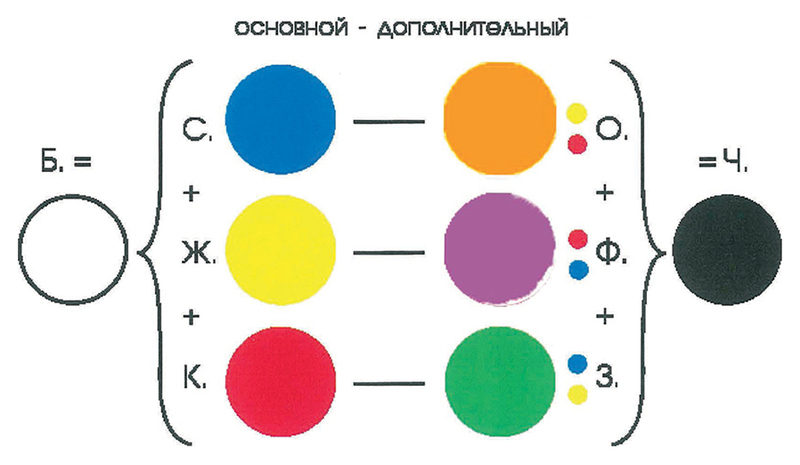 The point of conjugation, where the color changes to a complementary one, is the observer's position. 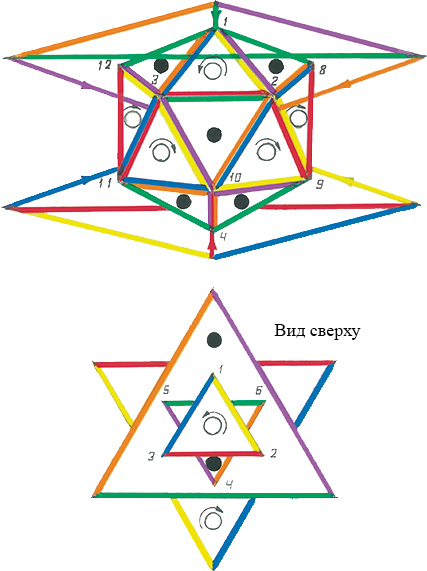 The conjugated pair of tetrahedrons is a basic spacial harmony module. The DNA spiral is built using the same principle. The top view shows a figure known in different cultures as "Vishnu's sign" or the "seal of Solomon", bearing multiple interpretations. 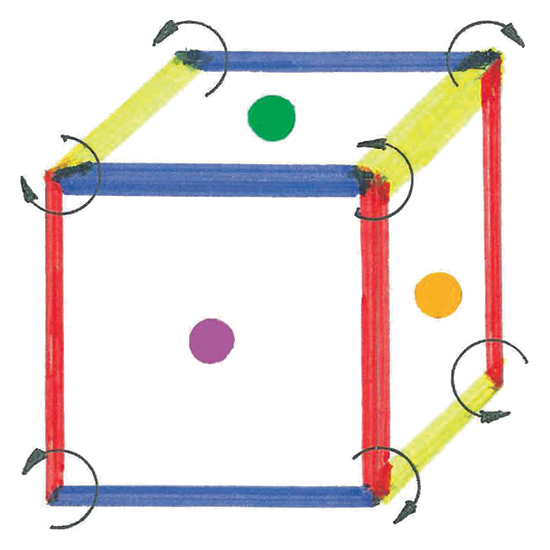 Conjugated pair of tetrahedrons can be built up to a larger body by adding nine more pairs of tetrahedrons with reverse sequence of colors (the reverse spin). 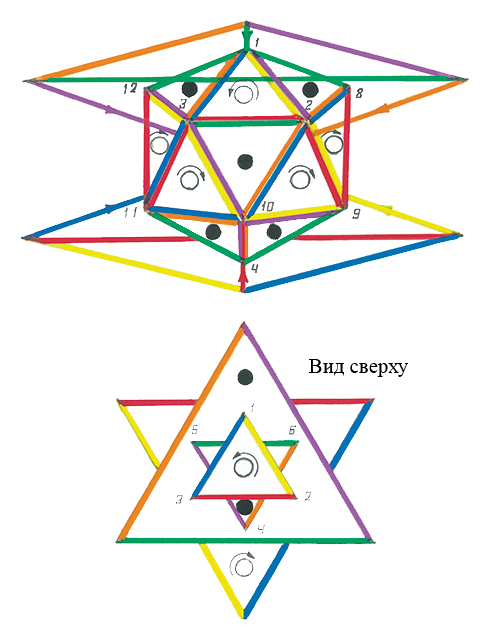 The resulting figure is called icosahedron, a regular 20-faced object, all of the external sides of which are made of black and white triangles (old Yin and Yang), while the internal colored sides (young Yin and Yang) are conjugated according to the complementary color principle. For the complete color congruence of the resulting icosahedron building the additional color beam extension is required. Thus we end up with a conjugated pair of tetrahedrons of a larger scale. The core idea here is that a cyclic process is inserted in the similar cycle of larger scale rotating in the opposite direction. 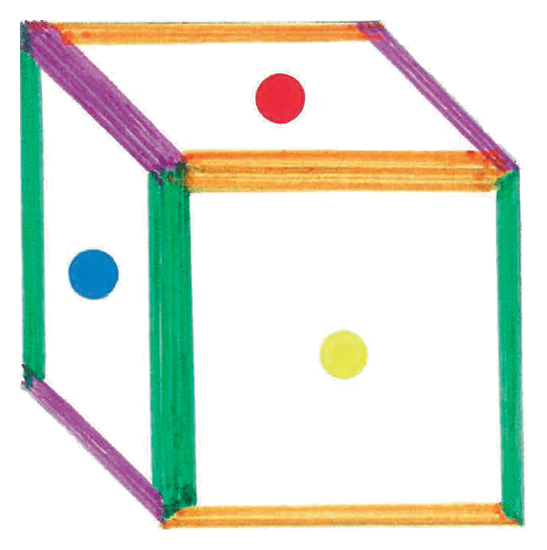 Conjugating the edges of two cubes and following the primary-complementary color principle (the same is true for the sides) we get an expanding cellular structure. 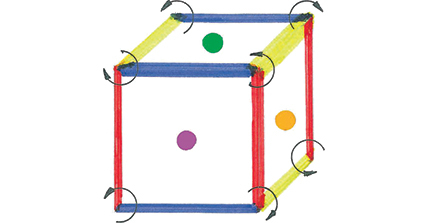 Each cubical cell of primary color will be conjugated with six more cells of complementary colors and visa versa. It seems perspective to use the proposed model along with structural model of physical universe presented by Dewey B. Larson. His theory is often called "Reciprocal theory" in which the observed universe is wholly explained by the effect of various kinds of motion. 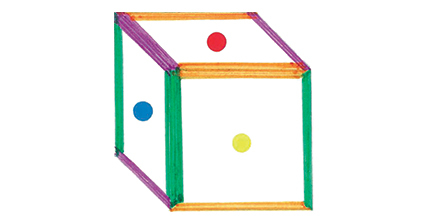 Cellular model of color helps to relate three-dimensional space with three-dimensional time through the transmutation of colors according to primary-complementary principle. Possibly the cellular structure we described above has two interwoven orthogonal systems of coordinates, axis of which are split on an alternating discreet pieces of time and space. The coordinate system rotation spin changes its direction at conjugation points where pieces connect. The simplest of possibles codes is a binary code, utilizing only one and zero. It helps to formalize calculations reducing it to a simple yes/no routine, at the cost of increased volume of data to store and operate with. The encoding that groups two initial conditions in triplets, notably used in the Book of Changes, allows to progress from linear logic to a plane logic. Trigrams are written down as vertical columns, made of solid and broken lines, not a sequence of ones and zeros in binary-octal code. Recombination of lines produces 64 hexagrams. 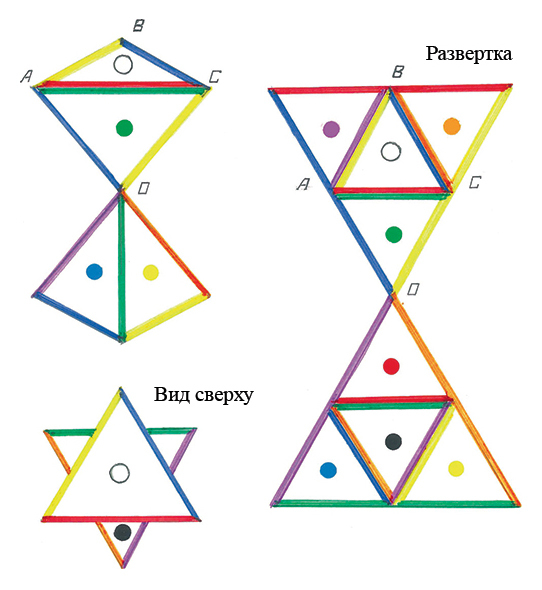 Relations between hexagrams are subordinate to reflection and inversion of symbols not a simple logical principle. Fractal geometry unfolds consequential approximations to solving functions with complex variables on a plane. The visualization of solution introduces the aesthetic element in a formal logic task. There are multiple processes in nature associated with growth, development and phase transitions, which are based on fractal principle. The Color Model based on I-Ching we propose, helps to progress from plane geometry to three-dimensional one. The color beams, unlike the lines that hexagrams are made of, can be arbitrarily placed and manipulated in space. The application of our Color Model helps to realize that Platonic bodies (regular polyhedrons) possessing absolute symmetry are not ideal (or color incongruent) in terms of our model. Additional color beams, projected in space make the model complete and provide further development algorithms. The sequence of colors (we have also used a term "spin") at the apices of polyhedrons show the direction of rotation, which is impossible to define without a Color model. Apices of polyhedrons are paramount in Larson's "reciprocal theory", acting as points in oscillating system that we consider atoms in conventional physics. The Color interpretation of trigrams shown at Pic. 3 [jump to] lays the basis for the harmonic logic, stretching beyond the conventional, black and white dualist logic. Possibly the practical implication of the Color Model is a gradual shift from the cause and effect scientific paradigm to a more intuitive multidimensional way of thought.